We’re pleased to finally unveil the first stage of decentralised community governance on Ethfinex. As of May 15th, Ethfinex users will be able to vote, directly from their Ethereum wallets, for the tokens which they wish to see traded on Ethfinex. Votes are completed using cloned ‘Nectar Voting Tokens’, issued to Ethfinex users in proportion to the NEC they own. At its core Ethfinex is built around its community of users. Traders who use Ethfinex will be responsible for contributing to its vision and development, subsequently earning a stake in its performance and (potential) success. Beyond just this, however, we’ve created Ethfinex as a tool for democratising the decisions that go into an exchange — fee structures, token listings, revenue decisions — to create a platform that is truly for the community, by the community. As an initial foray into democratising decision-making on Ethfinex, we’re pleased to finally unveil our long-term approach to token listings. Token listings on Ethfinex going forward will be dictated by NEC holders through use of a voting mechanism on Nectar.community. The voting period will open Tuesday May 15th at 17.00 UTC and will remain open for two weeks. 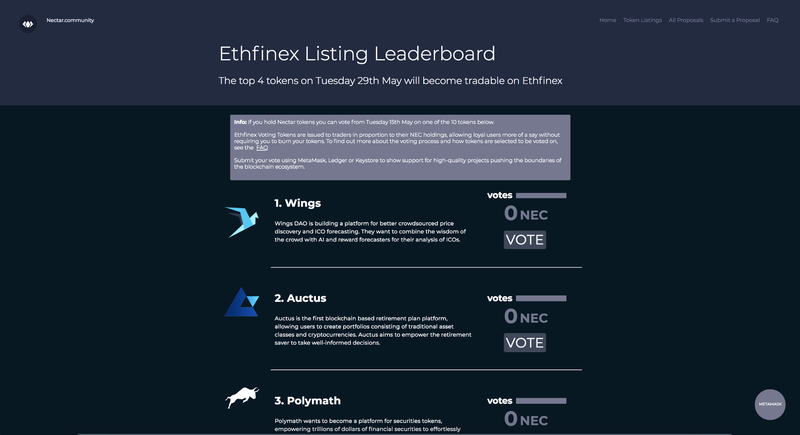 At the end of the two week voting period, the four most sought after projects will become tradable on Ethfinex. New projects will continue to make their way on to the list as projects are voted in. On May 15th, all NEC holders will receive an ‘NEC Voting Token’ in a 1:1 ratio to their NEC holdings. This allows users to vote without sacrificing their NEC, whilst still allowing the most loyal traders to have a larger stake in the vote. Unused Voting Tokens will disappear at the end of each voting period, with new tokens issued for the next round of community token votes. To vote, users will need to transfer a portion of their NEC from Ethfinex into their personal wallet (either a Ledger, MetaMask or KeyStore wallet). Users should transfer the amount of NEC which they wish to earn in Voting Tokens (e.g. if you want 100 Voting Tokens, you will need to transfer 100 NEC to an external wallet). Alternatively voting tokens once issued can be transferred separately into a wallet. We will be releasing more information concerning the voting process as well as a video tutorial prior to the start of voting. If you are an unverified customer but wish to participate in the vote, please stay tuned for more information. The nectar.community governance portal is where the community decides the fate and the path that Ethfinex takes. Our aim is to be a truly community-driven exchange — in practice, this means the community can suggest proposals and vote on proposals brought forth by others. We would love to see everyone getting involved, and we are incredibly excited by the prospect of democratising the decision-making process surround an exchange.